Breast-conserving surgery (BCS) is the primary treatment for early-stage breast cancer, but more accurate techniques are needed to assess resection margins during surgery to avoid the need for follow-up surgeries. Now, in a first-in-human study, British researchers have provided a possible solution using Cerenkov luminescence imaging (CLI), which combines optical and molecular imaging by detecting light emitted by the PET radiotracer F-18-fluorodeoxyglucose (F-18-FDG). 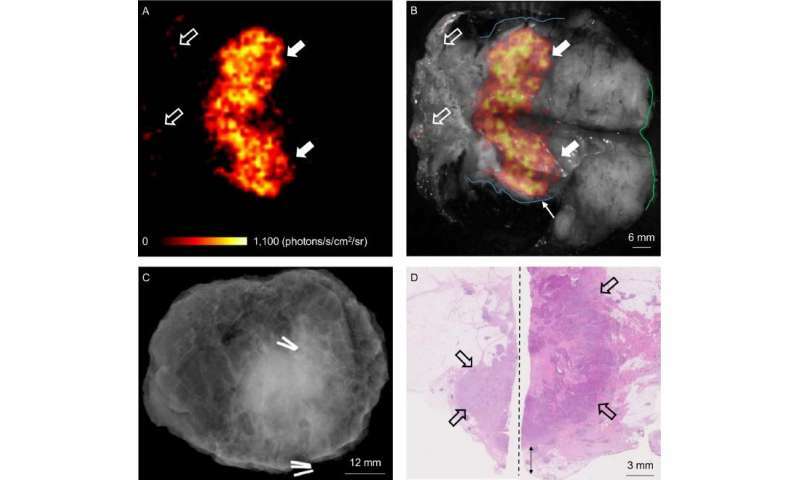 CLI's high-resolution and small-sized imaging equipment make it a promising technology for assessing tumor margins during breast tumor surgery. The study is covered in the featured article of The Journal of Nuclear Medicine's June 2017 issue. "Currently, approximately 1 in 5 women who undergo breast-conserving surgery, also known as lumpectomy, require repeat surgery due to inadequate excision of the tumor during the initial surgical procedure," explains Arnie D. Purushotham, MD, professor at King's College London, UK. "By accurately assessing tumor resection margins intraoperatively with CLI, surgeons may be able to completely clear the cancer with a single operation, thereby reducing the number of breast cancer patients requiring a second, or even third, surgical procedure. Ultimately this could lead to improved patient care and reduced healthcare costs if confirmed in larger clinical studies." This study included 22 patients with invasive breast cancer. F-18-FDG was injected 45-60 minutes before surgery. Immediately after the excision of tumors, specimens were imaged intraoperatively in an investigational CLI imaging system. The first 10 patients were used to optimize the imaging protocol; the remaining 12 were included in the analysis dataset. Ten of the 12 patients had an elevated tumor radiance on CLI, and agreement among raters on margin distance was good. Sentinel lymph nodes, which used technetium-99m to facilitate identification, were successfully detected and biopsied in all patients. F-18-FDG CLI is, therefore, a promising, low-risk technique for intraoperative assessment of tumor margins in breast-conserving surgery. A randomized controlled trial will evaluate the impact of this technique on re-excision rates. Purushotham points out, "The feasibility of intraoperative CLI as shown in this study, in combination with the wide applicability of F-18-FDG across a range of solid cancers, provides a stepping stone for clinical evaluation of this technology in other solid cancer types that also experience incomplete tumor resection due to close or involved margins." He also notes, "CLI offers the ability to image clinically approved and widely used PET tracers intraoperatively by using small-sized imaging equipment, thus expanding the field of traditional nuclear medicine."